It was time for a haircut. But, with Father’s Day approaching, this 42-year-old dad of three decided it was time for an upgrade. 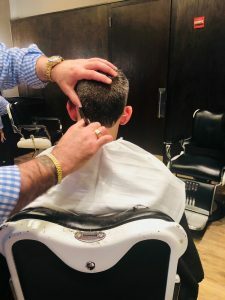 After years—a lifetime, really—of $12-$22 trims, I decided to venture into the higher end of hair care with a cut at The Grooming Lounge, a men’s salon with locations in Washington, DC and Northern Virginia that markets itself on providing customers with an extra level of comfort and personal attention. That includes hot towels and head massages. 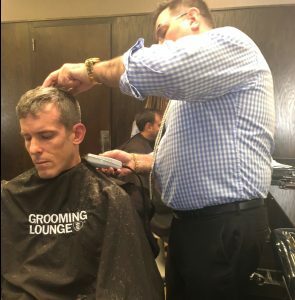 The real reason I visited The Grooming Lounge was to meet Rich Conant, a 25-year veteran of the hair cutting and styling business, who generously agreed to show me his collection of professional-grade clippers and share some advice on how to handle clippers like a pro. If you have an electric hair clipper in your home, the odds are good that Dad is using it regularly. AHAM’s Portable Appliance Research found that 56% of households own an electric hair clipper. In 88% of those households, an adult male is the primary user. Clippers are used an average of four times a month. As Rich worked his magic on my graying, middle-aged hair, I peppered him with questions on the finer points of clippers and technique. Let’s start with the clippers themselves. Clippers aren’t a one-size-fits-all appliance. You have probably noticed that your barber has an assortment of clipper attachments. If you buy a clipper, it will also come with a variety of attachments, or guards. Those determine how much hair you’re taking off. They’re numbered, generally from 1-8, and the lower the number, the closer the cut. The numbers refer to eighths of an inch. So, a #0 will cut very close to the skin, a #1 will leave 1/8 of an inch, a #2 will leave you with a quarter of an inch, a #3 3/8 of an inch, and so on. 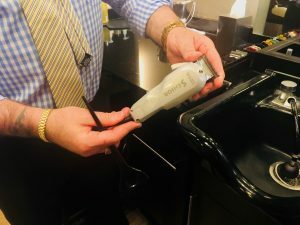 If you’re using clippers at home and have recently switched models, Rich cautioned that guards may not be measured exactly the same from model to model. The rule of thumb, if you aren’t sure about the length, is to start longer than you need. You can always take more hair off, but growing it back will take longer. When changing or attaching the guard, Rich strongly recommends double-checking that it is securely attached. This will prevent it from slipping off during the trim, which could result in a hairstyling disaster—a bald spot. Your barber’s commercial grade clippers likely have a locking mechanism to prevent slippage. If you’re doing the job yourself, make sure the guard you choose is for humans, not dogs. Some clippers come with dog-grooming attachments, which should be clearly labeled. Rich talked me through the art of hair clipping, pointing out the importance of constant visual assessment, measuring and balancing. A large mirror is your best friend, and a comb will help guide your work and help create a natural transition between the clipped hair and scissor-cut hair. “Use the comb as a guide to keep it even,” Rich says. 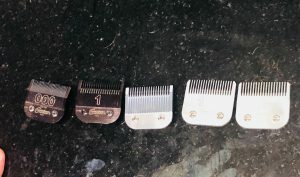 “As you move the clippers up, move the comb down to meet where you want to cut to.” Use a texturing shear to improve the transition between clipped and cut hair. When you’re going around the edges, you’ll likely get better results with a trimmer, not a clipper. They look similar, but a trimmer is smaller and is designed to help you get at smaller areas. “You could use clippers as trimmers, but it’s hard to get around the ears or do detail work,” Rich says. The clipper or trimmer are valuable tools for keeping sideburns to the preferred length. Whether you prefer a straight-across, no-sideburn look or full-on Elvis sideburns, balance is critical. “Make sure the sideburns are even,” Rich says. “Face the mirror and put your fingers at the bottom of each sideburn.” If your fingers are in line, your sideburns are balanced. If you have more exotic hair aspirations, like carving lightning bolts, your sweetheart’s initials or a Batman logo into your hair, clippers are the tool that can get you there. However, you’re probably better off leaving the job to a professional. When I raised the issue of elaborate designs with Rich, he mentioned that the road crew of a prominent 1990s alternative metal band had once been regular clients of his in California. He claims a Ferrari design among his clipper art masterpieces. Designs require very short hair and extreme precision. Rich sometimes would outline the design in felt pen before going in with the clippers. “Once you cut with the clippers, it’s permanent,” he says. Once the clipping is done, it’s time for cleanup. Fortunately, clippers need minimal care and maintenance. 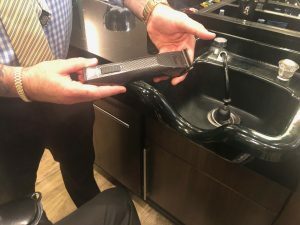 AHAM member Wahl recommends using the brush that came with the clippers after every use, oiling them regularly, and not using water to clean them. The use and care manual will offer specific guidance. AHAM’s research found that 72% of clipper owners clean it after every use or “frequently.” Most—78%—use the brush that came with the clippers. If you’re shopping for an electric hair clipper this Father’s Day, two important factors to consider are size and weight. The majority of clippers—83%—are purchased in a store. Shopping in person will let you test the size and weight, and the packaging will contain information about the specific attachments that are included, as well as other characteristics, like corded vs. cordless. AHAM research found that ease of use and price were the top factors for consumers when buying clippers. Thanks to Rich’s knowledge and skill, I’m heading into Father’s Day with a sharper-looking head of hair and knowing more about clippers than I ever thought possible. Whether you’re spending the day at the barber, by the lake, in the yard or at the game, happy Father’s Day!